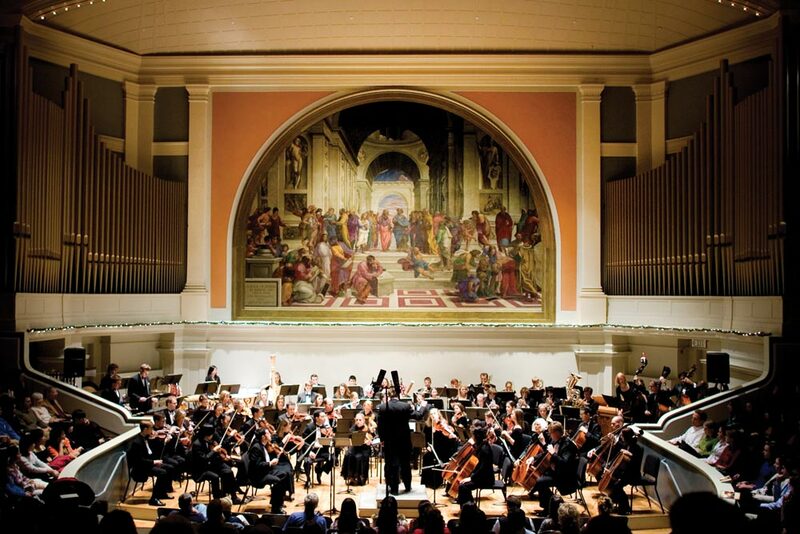 Soon after the Rotunda Annex was completed in 1853, a copy of Raphael's mural "School of Athens," painted by renowned French copyist Paul Balze, was installed in the Annex's 1,200-seat auditorium. 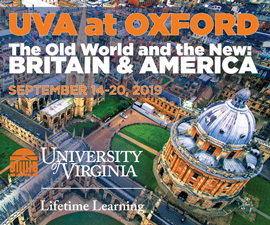 According to a UVA Library online exhibit, "the hundreds who contributed [to the cost of the mural] envisioned it as a 'nucleus of a Gallery of Fine Arts' that would, like the Academical Village, be inspired by ancient Roman buildings and provide American students with the opportunity to experience the masterpieces of Europe." After faulty electrical wiring in the Annex started the 1895 fire that destroyed the Rotunda Annex, along with the mural, architects McKim, Mead & White commissioned a replacement copy that would be incorporated into their design for Cabell Hall. George W. Breck, a muralist from New York who later served as director of the American Academy in Rome, completed the replacement mural in 1902. 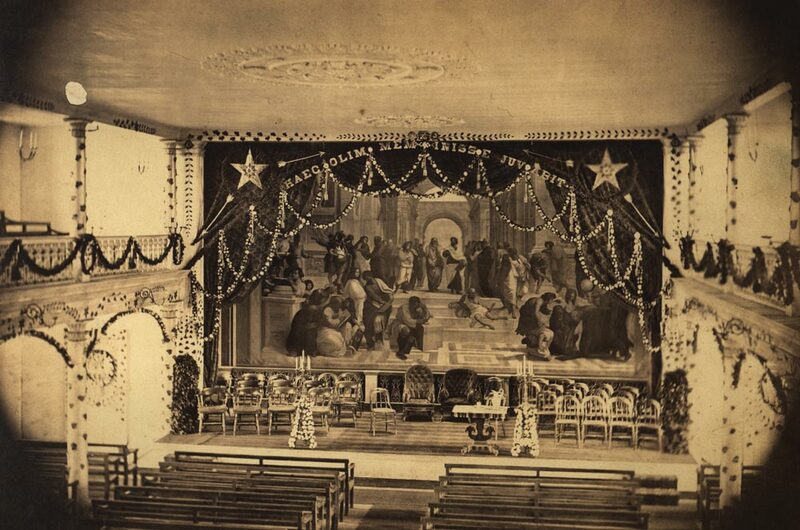 Breck made his mural four inches off scale from the original to comply with a Vatican policy prohibiting exact copies of its original artwork. A 1902 article in Municipal Journal and Engineer provides some background on the Cabell Hall mural's earliest days. "For a year and a half [Breck] worked in Rome upon the great canvas, a copy of the famous 'School of Athens.' ... This canvas arrived in New York, en route for its destination … and thus it was possible to exhibit in New York before being sent south to its final location. 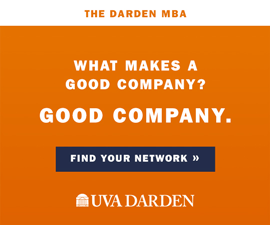 This is destined to form the focus of the great auditorium hall of the new buildings of the University, which have arisen Phoenix-like from the ashes of the old." Lincoln Perry has recently completed another large mural in Old Cabell Hall, titled "Students' Progress." Perry says the work, which spans the building's entire lobby, is intended to be a modern-day complement to "The School of Athens." 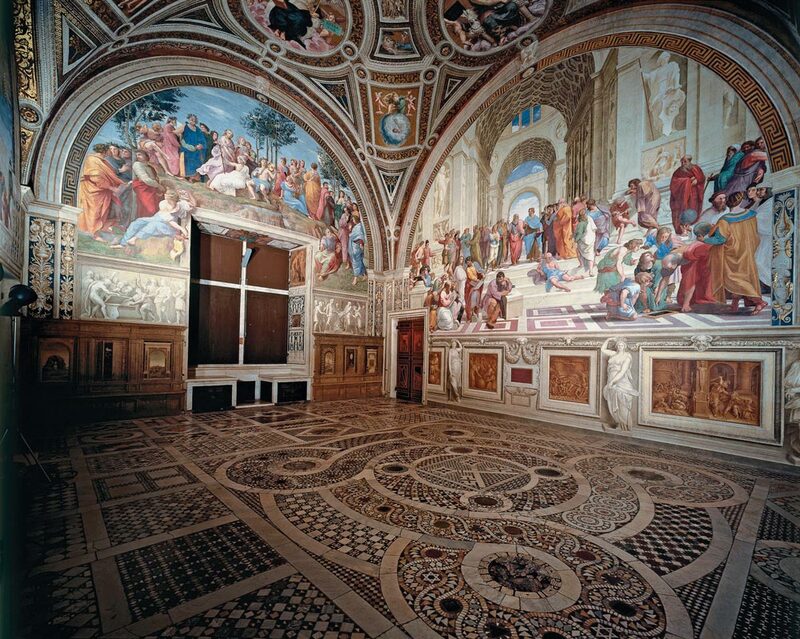 In 1510, Raphael completed his 400-square-foot original fresco in the Pope's private library in the Vatican.